Every product you sell needs a brochure. It’s one of those Business 101 things. Through the years we’ve printed several million brochures, and while that doesn’t automatically make us an expert, it sure doesn’t hurt. We know what papers to suggest to create a quality look or a discount price special brochure. 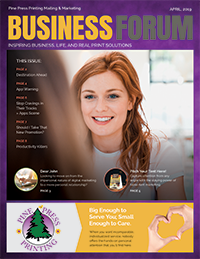 If you plan on mailing your brochure, we can recommend a paper that will stand up to the potential damage done during the mailing process. Our design team can also listen to your concepts and ideas, and help you create an attention-grabbing promotion piece. We can then print a beautiful one, two or four-color brochure to our exacting quality standards. 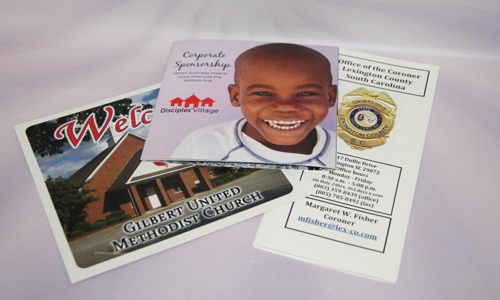 Round out your marketing materials with banners, postcards, and presentation folders. We can mail your brochures directly to your customers and prospects. Contact us for more details on how we can save you time and money on your direct mail brochure project and help you find new customers with customized mailing lists. We offer a choice of bulk mail or first class mail options. Call us with any questions on your mailing needs!